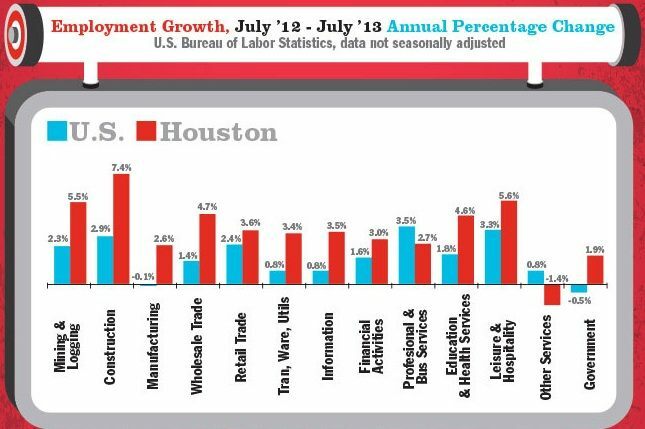 Having recovered over 201.9% of all jobs lost during the Great Recession, Houston is the powerhouse of America today, according to a new report. Employment in Houston is higher than at any time in its 176-year history, says the Greater Houston Partnership (GHP). This is a higher percentage than any other major American metro area. Houston is the fifth most populous MSA and the fourth most populous city in the United States. It has outpaced America’s ten largest metro areas, the report adds. Among the top metros, only Boston (123.4%), Washington D.C. (144%) and Dallas (158.9%), along with Houston have managed to recover more jobs than the number lost during the Great Recession. In 10 of 12 employment sectors, Houston has outpaced the rest of the country. Houston’s diversified economy helps drive and sustain economic growth over the long-term. With a broad network of research and development projects underway at The Texas Medical Center, and cutting edge technology in its energy industry, the city and its surrounding areas are well positioned to prosper into the future. Houston exported $110 billion’s worth of goods in 2012, making it the largest exporting metro in America, according to the U.S. International Trade Administration. This infographic contains a breakdown of why Houston is considered to be America’s economic machine.